Product #75 | SKU ZARM-L3 | 0.0 (no ratings yet) Thanks for your rating! 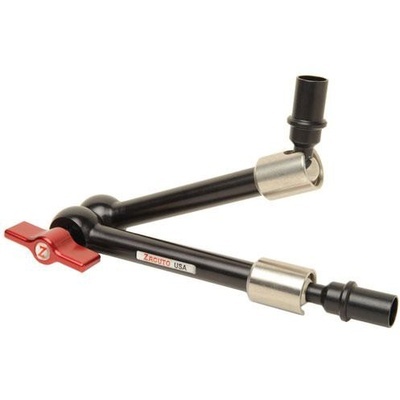 The Zamerican, V3 Large 12 inch articulating arm is 20% lighter than Zacuto's first articulating arm. It is made with chrome balls for silk movement, aluminum ends for rust reduction and stainless steel to increase strength and reduce bulk. It is built with Z-Release, giving you built-in quick release action using Zacuto's new Z-lock technology. Accessories install and remove with the flip of a lever. No more screwing and un-screwing and no more coming loose. Zamerican arms can be extended using Zacuto male rod extensions making articulating arms any length you want them to be. Zamerican arms require a Z-Release (quick-release) mount on each end of the arm.